A workflow stage can have as many action buttons as required. Typical actions might be: Approve, Reject or Request Finance Review. Button Name Enter the name of the new action button. You will now see your new action button on the right side of the screen. To configure the button to take the desired action(s), click on it to show the drop-down configuration menu. There are two classes of actions: Default Actions and Conditional Actions. These actions will run when the action button is clicked, unless there is a Conditional Action that matches the current situation, in which case that action will run. There can be multiple Default Actions, such as moving the record to the next workflow stage and also sending a notification email. These actions have a logical test associated with them, such as “Department field contains Sales” or “Total Value field is greater than 10,000”. If this test is true, the the associated Conditional Action will run instead of the Default Action. There can be multiple Conditional Actions, and each can have more than one condition it must meet. Change Stage Move the record to a new workflow stage and set the workflow status accordingly, e.g. Draft to Manager’s Approval or VP Approval to Rejected. Note: Once Change Stage has been selected once, it will no longer appear in the Type selector for that set of actions. This is because you can only change status to one other value, so there is no purpose for having multiple Change Stage actions. Send Email Allows you to select or create an email template so that an email message is sent to interested parties when the workflow action button is pressed. Redirect Allows you to select what should be seen by the user after the action button is pressed, e.g. go back to the prior view or open a specific form. Assign User to Role Allows you to set the value of a dynamic role for use in these action actions, e.g. setting the Approving Manager role to have the value of the Manager field on the current record. Next Stage If you select Change Stage as the type you will see the Next Stage filed. Select the desired stage records should move to when this button is clicked. Select Email Template If you select Send Email as the type you will see the Select Email Template button. Details for working with email templates to create customized notification messages are shown here: Email Templates. Options Select the desired Form, Page or View name from the supplied list. Dynamic Roles Select the name of a dynamic role to assign a value to from the list of dynamic roles in the application. Fields Select the name of the field to get the value from. Only Directory Lookup fields display in the list. 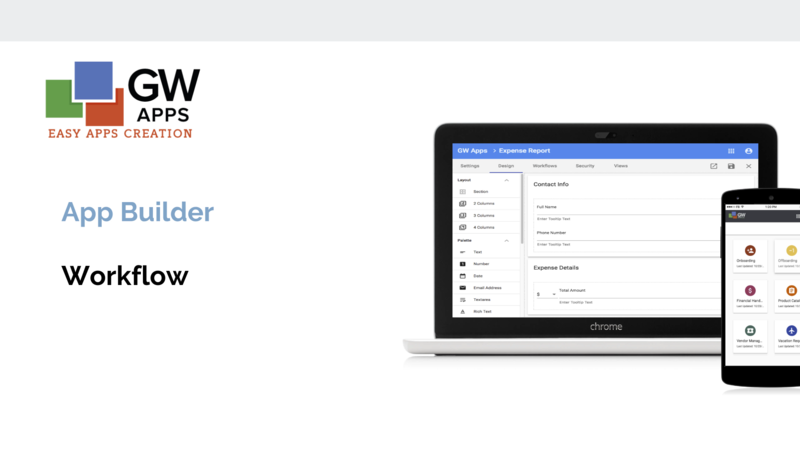 If the list is blank, then you do not have a Directory Lookup field on this form yet, so go back to the design tab and add one before completing the workflow action setup. Conditional Action number and name The Conditional Actions are automatically numbered 1, 2, etc. Next to the number is a name, which defaults to “Condition x” where “x” is the current number. 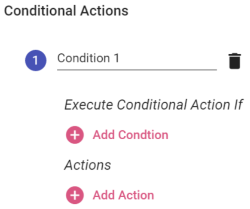 You can change the name, though the name does not display to the end user and has no functional effect, it can be used as a description to help describe what the conditional action is for. Field Select the desired field. Text fields: Equal, does not equal, blank, not blank, contains, does not contain. Number fields: Greater than, less than, less than or equal to, greater than or equal to, equals, not equals. Date fields: Greater than, less than. Comparison Value If blank or not blank are selected then the condition is complete. If another operator is selected then a comparison value is required. The comparison value field matches the field selected, so it is a number field if the Field was a number, and if FIeld was a pick from list (radio button, etc) the comparison field will be a list selector with the the same list of values. Adds an Action to the end of the actions list. Details for the Actions are identical as those in the Default Actions.